Utility Transmission & Distribution companies are responsible for keeping the lights on through on-going maintenance, upgrades, and emergency repairs on electrical substations. When utility companies need to deploy a mobile substation for any reason, TPC Wire & Cable offers Super-Trex Type SH Single Conductor Flexible Medium Voltage Shielded Power Cables for Mobile Substations for a reliable solution to connect the mobile into the substation. Our Type SH cables provide excellent durability and flexibility making installation faster, easier and safer for the user. 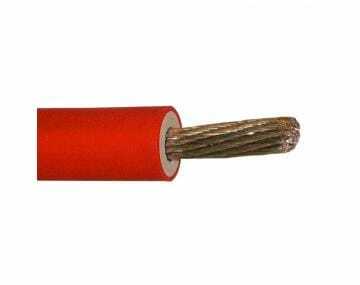 We maintain a deep inventory of these medium voltage cables ranging from 5kV to 35kV with a wide selection of AWG sizes allowing customers access to products quickly. Plus, we don’t make our customers buy quantities they don’t need. In fact, we will cut the exact lengths they require saving them time and money. Our trained technicians can install customer-specific medium voltage connectors and electrically test each finished assembly in-house. By the time our products are received on-site by a customer, they arrive tested and ready to install immediately. Should customers require a storage and deployment trailer for these cables, we are a one-stop-shop. Our trailer systems are state-of-the-art, customizable, and allow heavy portable cables to be deployed to multiple sites quickly and efficiently. 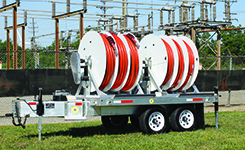 These trailer systems allow cables to be deployed and retrieved safely protecting personnel from harm and equipment from damage.